Fire, as seen in nature, is generally viewed as destructive. However, this destruction often provides a opportunity for growth. Fire is further perceived as a connected and aggressive basis for movement in Martial Arts practices. Image 6 shows a forest fire in Montana. In particular, the connected and powerful nature of Fire is demonstrated. Video 3 Shows fire movements from To Shin Do demonstrated by Master Mark Sentoshi Russo and Scott Bragg. Related techniques are typically forward moving and energetic. These aggressive movements are anticipatory in nature, seeking to intercept the movements of opponents before strikes materialize. This approach requires aggressive moves that pre-empt the techniques of an opponent. The idea is to close distance quickly, intercept an opponent’s strike, and incapacitate the opponent as quickly as possible. An analogy in nature could be seen as a quick catastrophic event like a forest fire. 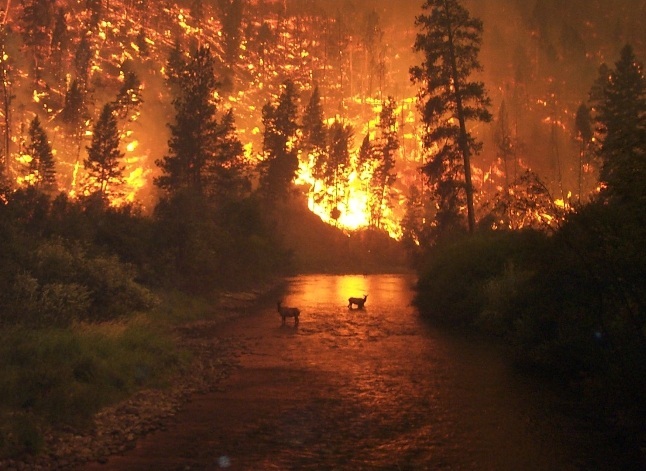 The nature of a forest fire affects (is connected with) all levels of the related ecosystem. The fire itself is a very aggressive event burning all the fuel with which it comes into contact. Fire, as a personality type, is described as type A. This personality is associated with being ambitious and aggressive. It is also viewed as an on-the-ground type of leadership. The military equivalent would be a field officer (Russo, 2010).